The two apartment buildings, which are somewhat taller than the nearby rowhouses, are part of a 33-acre redevelopment effort known as Center West. The 260 apartments face — and dwarf — the tiny Edgar Allan Poe house on Amity Street. Not far away is the University of Maryland BioPark, and the circular roof and pinnacle of the B&O Railroad Museum is easily spotted to the south on Poppleton Street. 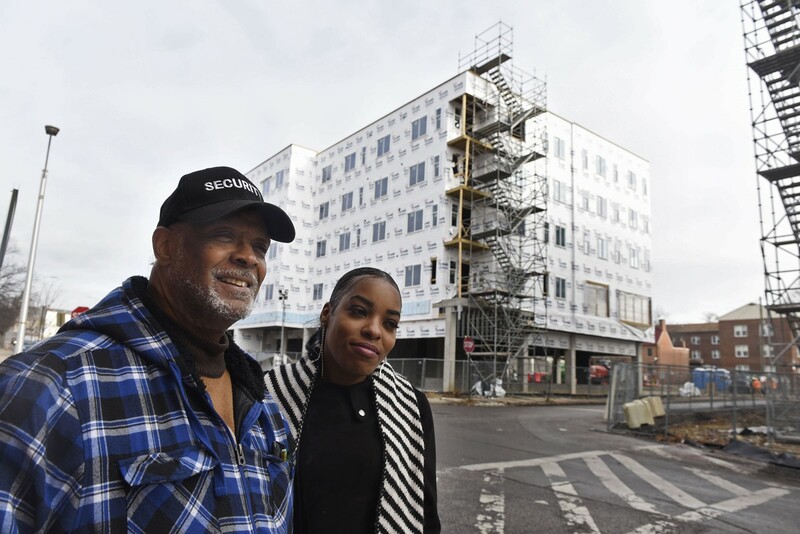 William Jackson, a retired Baltimore police officer and Poppleton resident, looked around the site and said, “Where you see that building, we once had a popular grocery store, Doody’s, where everybody from the community shopped. We once had Sampson’s restaurant on the corner of Fayette. It was known for its bread and rolls. There were once blocks of houses, all torn down. Two New York firms, La Cite Development and BRP Development Corp., are developing Center West. The apartments — which include access to a dog walking park and a swimming pool — will rent at market rates. About 20 percent of the units are designated as affordable housing. While Poppleton residents have long waited for something to appear at Schroeder and Lexington, their institutional neighbor, the downtown campus of the University of Maryland, has steadily built structure after structure along West Baltimore Street. Jackson owns a security company that provides protection for the site. “Having people from the neighborhood protect the place is a good way of making friends with the neighborhood,” he said. Jackson, who grew up in the Lafayette Courts public housing development near the Shot Tower, bought a home on Vine Street 33 years ago for about $50,000. He has patiently waited for a change in his neighborhood’s fortunes. When he arrived in 1985, his house was part of a group of residences marketed under the name Harbor Homes. He and others on Vine Street still use that name to identify their enclave. Until about a year ago, Poppleton was like a neighborhood beset with 33 acres of vacant lots. Visitors to the Poe House could stand at its front door, look west and see a scene of West Baltimore as it might have looked when Poe was a boarder in the tiny brick residence. There were a few scattered trees, acres of weeds and a slight depression where Schroeder’s Run once flowed. Much of the Poppleton neighborhood was constructed before the Civil War. Historians believe the Poe House was one of the first homes constructed here. The expansion of the Baltimore & Ohio Railroad in the 1840s pushed along construction of housing for workers employed at its industrial shops. Thomas Holdsworth Poppleton, a London-born surveyor, lent his name to the neighborhood via Poppleton Street, which bisects the railroad museum property. He never lived in the neighborhood — he had a Howard Street surveying business — and died impoverished in 1837 despite laying out the B&O’s original city route along Pratt Street.